Kristoferson Farm is the Gold Award winner at the Family Business Awards. CULTIVATING NEW OPPORTUNITIES: Members of the Kristoferson clan gather in front of the century-old barn where gourmet community dinners now take place. Photo by Hayley Young. Kristoferson Farm has cultivated beyond agriculture. Visitors can zip line over its forests or stay on terra firma to enjoy monthly farm-to-table dinners. The farm maintains a sustainable timber business and grows organic products such as hay, lavender and apples. It sells its commodities wholesale as well as from an on-site store. For the zip line adventures, Canopy Tours Northwest has attracted more than 50,000 guests since 2011, and for the past two years, the farm has hosted 50-guest dinners inside its barn, featuring food from local chefs and wines from the region. This fall, a new sport/recreation venture called Terra Teams opened, offering facilitated, goal-oriented adventures for groups using the farm and forest infrastructure. The farm employs five full-time and 40 peak-season workers. Since 2011, newer enterprises have hiked revenue from five figures to the high six figures, says Mona Kristoferson Campbell, co-owner. The profit goes toward maintenance and preservation for bridges, barns, roads and habitat. The business has been honored for restoring salmon-bearing streams and wildlife spaces. Campbell and four siblings, as shareholders, view themselves as stewards, passing heritage to future generations. 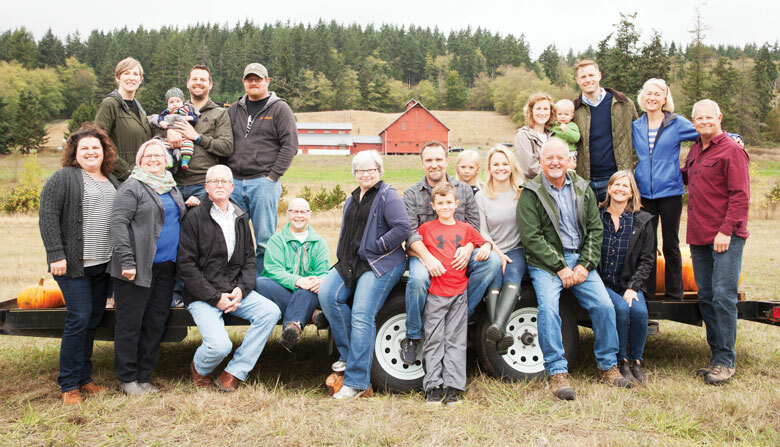 Their roots go back to Campbell’s great-grandfather, Alfred Kristoferson, a Mercer Island and Seattle pioneer dairyman who bought the farmland in 1912 for his son, August, Campbell’s grandfather. Operations on the 231-acre farm now involve 25 family members ranging from 6 months to 93 years, including a sixth generation. Former Navy officers Bob Whitelatch and Crista Claar Whitelatch returned in 1983 to expand the family farm in Pasco’s White Bluffs growing region. Vineyards now cover 130 acres on south- and southwest-facing hillsides above the Columbia River. The operation makes bulk wine for Claar Cellars and for sale nationwide. Its bottled wines are sold in 26 states, as well as Canada, China and India. Crista’s grandfather, Ed Albro, once envisioned a vineyard as he stood overlooking the Columbia River. But it was her parents, Russell and Audrienne Claar, who developed the farm in 1950 and planted the first grapes in 1980. Crista’s sons, John and James, members of the family’s fourth generation, joined as full partners in 2013 after being raised on the farm and working alongside their parents. Founded in 1891, Washington Shoe Company has made large strides since it began making rugged outdoor boots under the Western Chief brand for prospectors heading to Alaska and the Yukon during the Klondike Gold Rush. Four generations of the Moehring family have run the company, now led by CEO Karl Moehring. By the 1990s, success bloomed with women’s rain boots and then children’s styles. Washington Shoe Company now boasts three footwear brands: Chooka (women’s on-trend footwear and boots), Western Chief (children’s rain boots) and Staheekum (sheepskin boots, shoes and slippers).